﻿ Lightning Ptoection Tips from Ohio Valley Lightning Protection, Inc.
During the Middle Ages church bells were rung in belief that they would diffuse lightning. many medieval bells were engraved with Fulgura Frango ("I break up the lightning"). 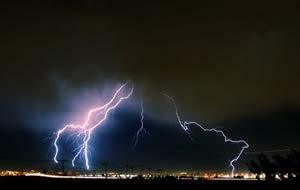 This suspect theory was discredited by medieval scholar who observed that over a 33-year period, there were 386 lightning strikes on church towers and 103 fatalities, but with today's technology and the past experience of Ben Franklin many of these bells and churches are protected with well grounded lightning rod systems. » First choose shelter in buildings equipped with lightning protection systems. » Choose shelter in a metal frame structural steel building second. » Choose shelter in a a car. » Choose shelter under a cliff or in a cave. » Lay flat on the ground, in a ditch or depression Choose shelter in larger buildings not equipped with lightning protection systems. » As a last resort, choose shelter in smaller buildings without lightning protection systems. » Stand outside exposed in your lawn as a thunderstorm approaches. » Stand under an isolated tree as a thunderstorm approaches. » Operate a lawn mower or sit on a riding mower as a thunderstorm approaches. » Ride a bike or horse as a thunderstorm approaches. » Don't stand near bells that say "Fulgura Frango"